This is an erosion case. Patient likes to taste lemon by placing lemon between the teeth and lip. The cervical (neck) area of the front teeth are eroded away by the acid from the lemon creating the yellow lesion you see. 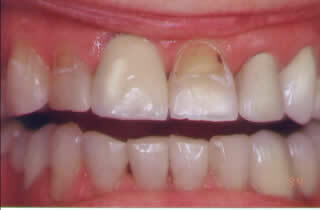 3 Empress crowns, 1 empress veneer and 2 tooth-coloured fillings were done. 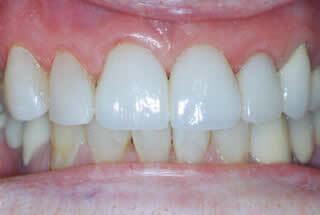 With careful planning, different materials can still be mixed and matched to create excellent clinical result.